So, Today I have joined a group... I belong to a web forum "OhBaby" which is mostly mums with kids, and there is a thread on there about starting a Facebook group "July - A photo a day". So I joined it with great motivation. My husband has a beautiful camera (photographed above with my crappy camera, also pictured). So I thought it would be a good opportunity to use it. But now, I am thinking it's going to be harder than I thought. I can't even update this blog, let alone take a photo a day and upload it daily! I've decided to post my photo a day on my blog as well for the month of July. So my first picture for July, there is a story behind this photo too, which is always great. I went to Marshalls Farm near Tauranga (aka Marshmellows Farm), and Isaac had nice white fabric shoes on, they got poo and dirt all over them. So I made it my mission yesterday to buy Isaac gumboots. I found some plain boring black ones at The Warehouse for $13. 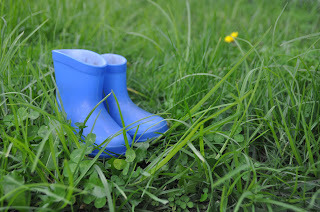 Then this morning I go into the shed, and sitting there, in the middle of the shed is a pair of cool blue gumboots! My darling husband didn't tell me there was a pair there (He'd been given a box of outdoor toys etc about 6 weeks ago). He goes in the shed EVERY DAY! I dug the barcode tags out the rubbish bit and returned the warehouse gumboots today. Talk about a mission alright!